The Crysteel aluminum A-Tipper has been updated with innovative features and a modern aerodynamic design. 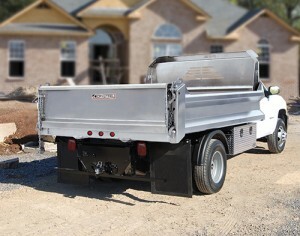 The A-Tipper is designed for contractors and municipalities that need strength, durability and lightweight efficiency. The A-Tipper offers significant strength and added safety with a strong crossmemberless understructure with 8-in. longsills and a 1/4 integrated, tapered cabshield. Aluminum’s lightweight profile offers increased payload capacity, corrosion resistance and lower maintenance costs. The A-Tipper comes with the all-new independent locking latch that allows users to easily drop the tailgate, spread-through, or simply remove. Crysteel offers a comprehensive, five-year warranty on all dump bodies and hoists.